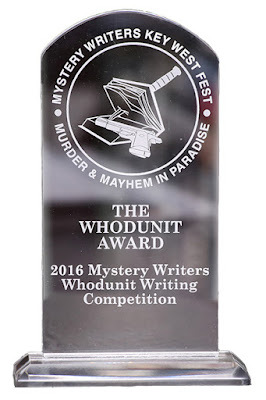 Key West, Florida Keys, March 17, 2017 -- Mystery Fest Key West has announced a call for entries for this year’s Whodunit Mystery Writing Competition. The winner will claim a book-publishing contract with Absolutely Amazing eBooks, free Mystery Fest Key West 2017 registration, airfare, hotel accommodations for two nights, meals and a Whodunit Award trophy to be presented at the 4th Annual Mystery Fest Key West, set for June 16-18 in Key West, Florida. Sponsored by Absolutely Amazing eBooks and supported by the Marion Stevens Fund at the Community Foundation of the Florida Keys, candidates wishing to compete for the 2017 Whodunit Writing Competition are invited to submit the first three pages (maximum 750 words) of a finished, but unpublished manuscript to whodunitaward@mysteryfestkeywest.com no later than April 15, 2017. There is no fee to enter, finalists will be notified by May 1, and will have until May 10 to submit full manuscripts.